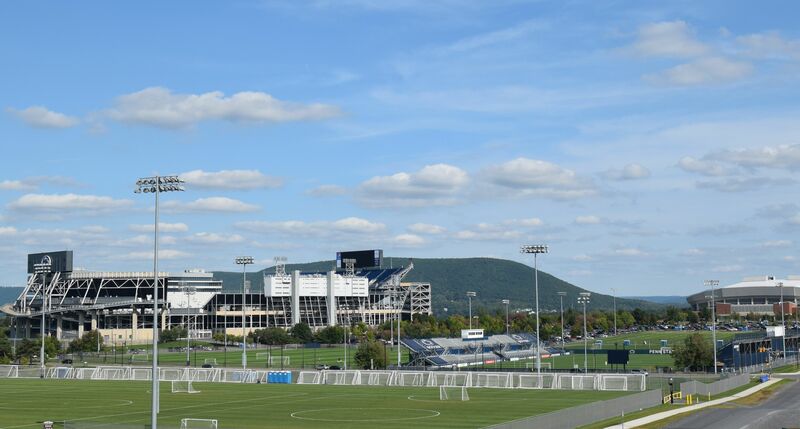 It’s another one of those perfect fall days in Happy Valley, the latest in a week full of them: a crisp, cool morning followed by a warm, sunny afternoon. Perfect autumn weather. Perfect football weather. On Saturday, of course, the (so-far) perfect Nittany Lions host UMass at Beaver Stadium, and they’re heavily favored to improve to a (still) perfect 4-0. And speaking of perfect, or nearly so: 31-3-1. Thirty-one wins, three losses, and a draw. That, as of Friday morning, is the combined record of Penn State’s fall sports teams. And nearly all of those teams are in action, at home, this weekend. It starts Friday afternoon when the 6th-ranked field hockey team (5-1, their only loss a 1-0 overtime setback at UConn) opens Big Ten play against Michigan. That one gets rolling at 4 p.m., and also marks the beginning of a weekend-long celebration of 50 years of varsity women’s athletics at Penn State. * The No. 3 women’s volleyball team (8-1, their only loss a five-set battle at No. 2 Stanford) hosts the Penn State Alumni Classic at Rec Hall. Starting Friday afternoon, the Lions face Eastern Illinois at 4 p.m., then are back on the court at 7:30 tonight against DePaul. The tournament continues with two more matches on Saturday, against UIC and East Carolina. * Also Friday night, the 8th-ranked women’s soccer team (6-1-0, their only loss coming on the road, in overtime, against national power UNC) looks to improve on its perfect Big Ten start when it hosts Ohio State. That one kicks off at 6 p.m.
* Sunday at 1 p.m., the No. 8 men’s soccer team hosts the Buckeyes in an early Big Ten battle. The Nittany Lions stand 5-0-1, with a road draw at James Madison their only blemish. So we’ll see you Saturday at Beaver Stadium—and if you can find time to get out to Rec Hall, Jeffrey Field, or the field hockey complex at some point to support the rest of Penn State’s fall teams, well, that’d be perfect. This entry was posted in Uncategorized and tagged field hockey, men's soccer, women's soccer, women's volleyball. Bookmark the permalink.